What happens at the Getty in a single year? A lot more than you might think! As president of the Getty Trust, I’m often asked to explain what the Getty is. 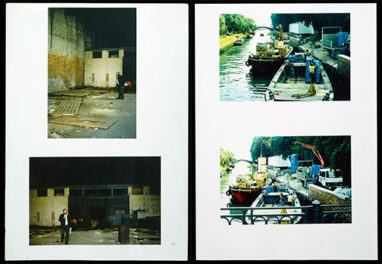 Are we a museum? A library? A publisher? A conservation center? Yes—we are all this, and more. We like to think of the Getty as a living laboratory for the arts, one that invites you to visit and take part. 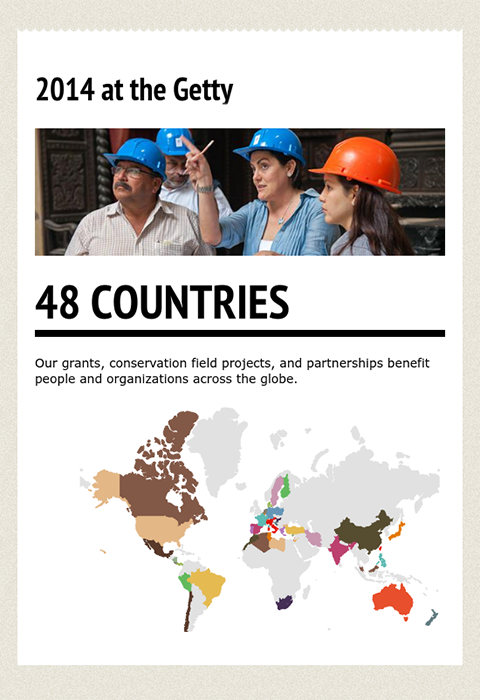 Fueled by collaboration across our four programs, we conserve, study, and share art and cultural heritage not only in L.A., but also around the world and online. I’d like to share a snapshot of just a few of the people, places, and ideas we were fortunate to support in 2014. 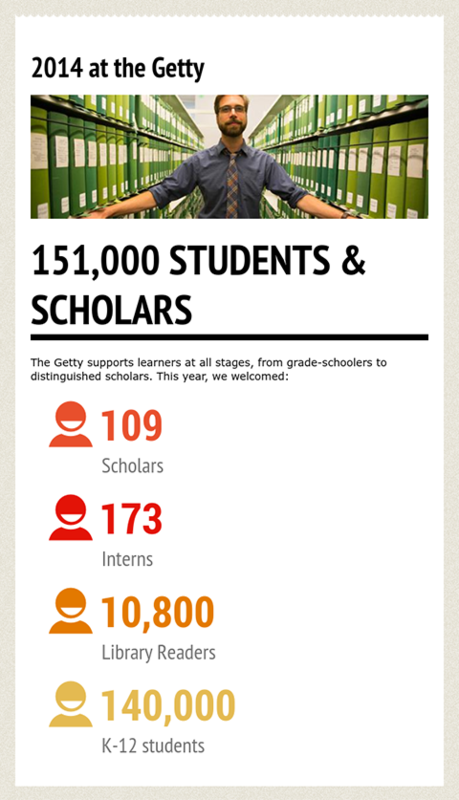 Expanded the Getty Museum school-visit program, welcoming some 140,000 students from over 2,100 schools. Registered over 900 new researchers at the Getty Research Institute library, bringing the total to more than 10,700. Brought well over 200 scholars and interns to the Getty through Getty Foundation grants. International collaboration is a critical part of the Getty’s work, and one that most visitors are surprised to learn about. Did you know that the Getty has worked on all seven continents—including Antarctica—over its 60-year history? 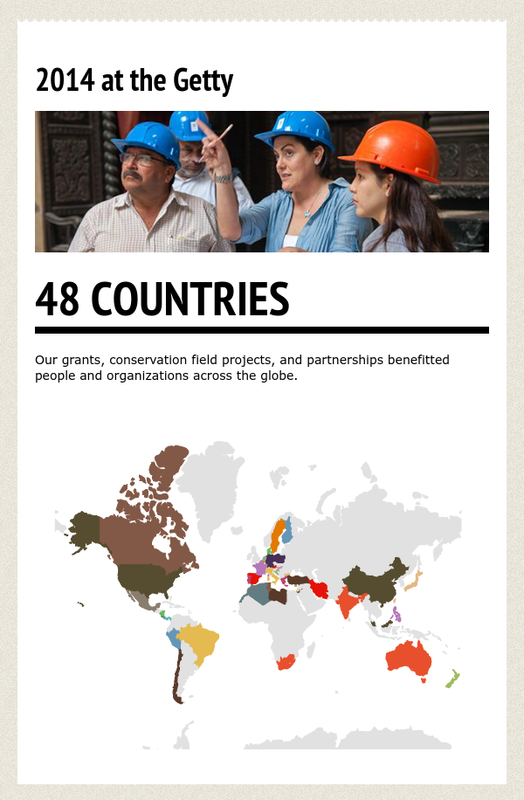 This year our grants, conservation projects, and scholarly collaborations extended to 48 countries. The Getty Conservation Institute alone was active with field, training, and scientific work in 18 countries, from China to South Africa. 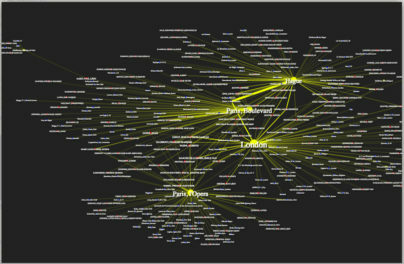 As a lab for the arts, the Getty is a forum to create, debate, and share new ideas. Through our events, exhibitions, books, research resources, website, and social media, we strive to share research and ideas with the widest possible audience. We took an exciting step toward this goal in 2014 with the launch of Getty Publications’ Virtual Library, which offers 277 books for free download, and the release of two of the Getty Research Institute’s major art databases in a freely reusable format. On behalf of the entire Getty community, I offer our sincere thanks for your support and interest in our work. I’d love to hear from you; if the Getty touched your life this year, please share your thoughts in the comments below or on Twitter or Facebook. Some of the wonderful things to see at the Getty Museum; take some time and visit with your children over the holidays. My three children love the Getty. I have a 8, 6, and 5 year old. The villa is so much fun for them. They are transported back in history when we are there. Thank you for all the memories. It was a beautifully well done film. It was fascinating to learn of your conservation efforts. During trying times, whether personal, political, or populist, it’s comforting to know that great Institutions like The Getty are there to educate and encourage us regular folk. Excellent video! All best for an even more impressive and productive 2015! I’m sure you don’t remember me (and if you do, I’ll be somewhat embarrassed) but you were my art history teacher a long time ago. I was a pretty awful student, but your class stuck with me, and it made a difference. Congratulations for your achievements. It looks like many others will benefit from your efforts just as I did. Please make the music accompanying your communications as beautiful as the art. It was a serious mismatch. Thank you for the wonderful opportunity to visit the Getty with my students. This will be our third year. It has been an unforgettable experience for my students. Will visit you soon again. 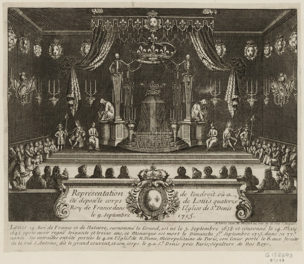 Getty makes me dream, get transported to past, connect to my inner self. I’m an unconditional fan! I love the Getty Museums, I visit both regularly. Even If I didn’t see any art, which I enjoy experiencing every time, I would go anyway to bathe in the warm friendliness, behold the incredible architectural and landscaping feats of genius, and brush up on my art history. Go and go and go again, it’s always a wonderful experience, and so enriching. 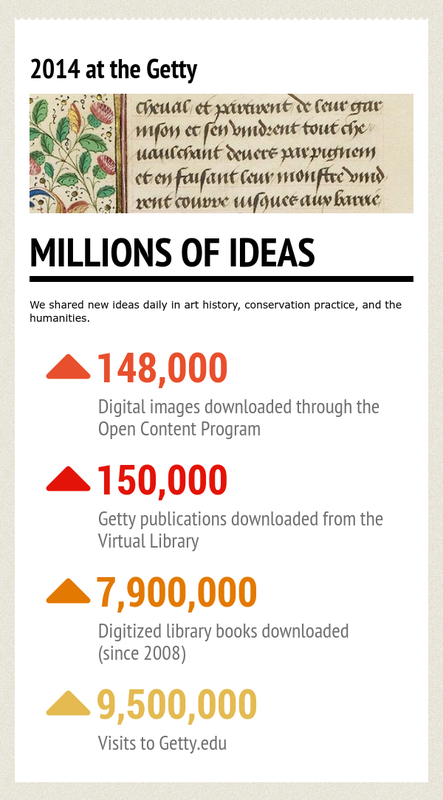 Thank you for this fascinating summary of The Getty by the Numbers! It is impressive how much has been done in the past year. Living in the “Frozen North” of Alberta, we can only get to the Getty (Center and Villa) every few years. However, each visit has been memorable, and only whets our appetite for a return trip. Thank you for being The Getty! The Getty is so wonderful words cannot do it justice. Go, let your spirit soar. When we retired and moved from Los Angeles, I knew we would really miss our visits to The Getty. I was correct, however, I didn’t realize how much I’m still able to learn and share via your website. Thank you for reaching out. We are here and truly appreciate all you are doing! Our ranch is SO different than living in LA! Where we used to be about 20 feet from our neighbors homes, now our closest neighbor is more than two miles away. The closest business (a gas station) is more than 20-miles. Our grocery store is over 40-miles away. You are our best connection to a world we know is out there. Keep up the good work. Thank you for this film-insight into the wonderful work which you are doing at the Getty. Congratulations. And how many numbers you collected! Are numbers a form of art, or should it become art at some point? Many best wishes for 2015! Words will not do justice to our pleasure, happiness and joy of visiting both locations which we have been doing for over thirty years. Your innovations and accessibility to your collections is as commendable as Mr. John Paul Getty’s gift to our nation and community. Perhaps while you’re touting the 140,000 students who visited the Getty’s campus, you might make mention of the nearly 100 volunteer docents who guide the vast majority of those students through our galleries? The docents are the heart of the Getty’s single-visit tour program and they work incredibly hard on a volunteer basis to give students from Los Angeles and beyond a meaningful experience with the art and objects in the Getty’s collection. Every time I visit the Getty Museum I am so thankful to Paul Getty for his enormous CULTURAL donation to our nation that I exclaim to our dear Lord; please, Lord, have him in your Glory! On the other side; don’t you think that the music of your video is incredibly discordant with the level of art of this great Museum and educationally misleading? Have only been once to each site but the visits were fabulous. Really enjoyed them. On par with european museums! Thankful for the video, a reminder to try and make an effort to visit more often..its just the traffic which is a challenge!